So I'm stuck at home with a sick kid today but that has given me time to prep for tomorrow's lesson with Grade 4. 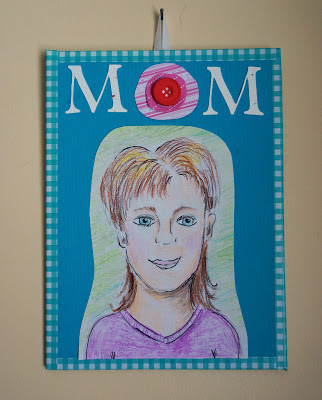 As a Mom I love handmade Mother's Day gifts. This year Grade 4 will do portraits. 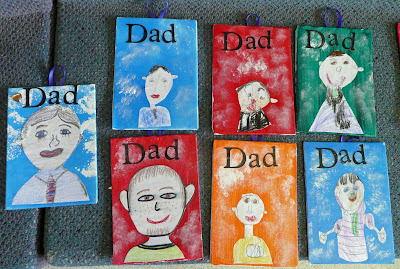 Last year Kindergarten did one for Father's day. Paint canvas board with acrylic paint. Set aside to dry. 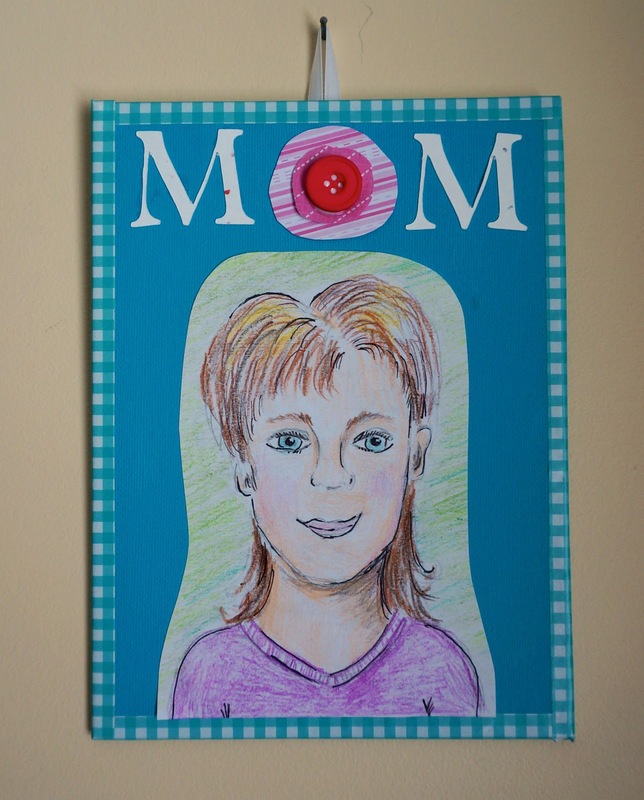 Using a piece of paper cut slightly smaller than the canvas board sketch out Mom's portrait. Add some colour using coloured pencils and crayon. Because we are going to podge this portrait we do not want to use anything water soluble or it will just smear. Using a fine sharpie do some outlining. With Grade 4 we will do the sketch technique. We don't want to do every line and we want some gaps in our outlines so it looks more like a sketch. Cut out. You can get tight to the portrait like with the Dad portrait or leave some background. Set portrait aside. Wrap the edges of the canvas with decorative tape which I also found at the Dollar store. Now we add the word MOM. I cut out a bunch of M's with the Cricut but you could also hand letter or print letters out from the computer and trim. For the O we are making a little flower. Mine is quite circular but you could also cut in petal shapes. Out of scrapbooking paper or coloured paper cut 2 circle shapes. Glue into place and add button. Give your portrait a nice coat of podge to secure everything and to add a nice gloss. Add a ribbon loop to the back for hanging.